ATURMJU rose 4 sen or 12.31% to close at RM0.365 yesterday. Yesterday's price closed higher with bullish white candle on the back of higher than average volume after their recent pullback. Resistance levels are expected at RM0.515 (R1) and further to RM0.600 (R2). 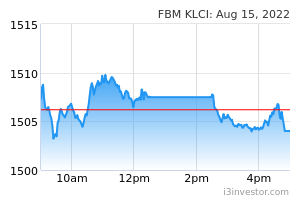 Conversely, support levels can be found at RM0.280 (S1) and RM0.275 (S2).